having rode it many times while a cadet at St. John's Military Academy. 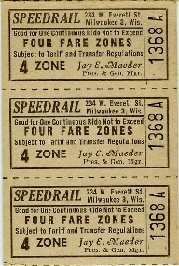 Maeder formed the Milwaukee Rapid Transit & Speedrail Co., which was more commonly known simply as Speedrail. The first official run was Sept 2, 1949. (Shaker Heights) and numbered those 60 - 65. He later added two more cars from Shaker Heights, number 300 and 301. Several of the heavyweight TM interurbans remained on the roster for peak travel times. 10 deaths and many injuries. The resulting claims and loss of ridership put the company in a downward spiral. All service ended on June 30, 1951. (close clearances at Waukesha loop) were confined to the Hales Corners runs. Speedrail 33-34 heads through Waukesha. Speedrail to replace the heavy-weight interurbans. units were kept on hand. London & Port Stanley line in Canada.